We’ve been spending a lot of time touting how great our Fombags are for decorating your living room or apartment. But have you considered how great they would be for a baby’s room? It’s the one piece of furniture that they’ll never outgrow! A Fombag would be an ideal piece of furniture for any nursery. When your new baby comes into your home, imagine yourself sitting in a comfortable Fombag while you rock them to sleep. 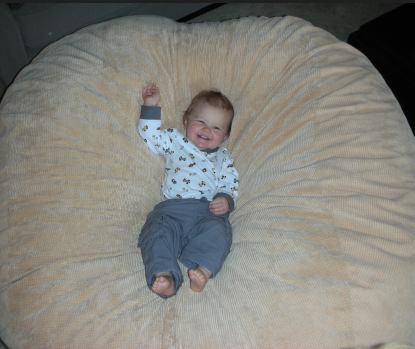 Your child will learn that his or her Fombag is a place where they can relax, be comfortable, and experience comfort. As your child gets older, he or she will begin to enjoy the Fombag alone. Nothing will be cuter than watching your toddler climb up and onto a Fombag. Our Fombags are durable, so they’ll be able to put up with whatever your child can throw at it. With proper care, your child might even be able to take his or her Fombag off to college! (By that time, they might be asking for a newer, bigger Fombag.) Either way, a Fombag is an investment in your child’s comfort for years to come.